Inspired by the folks at Land Art Generator Initiative who are leading the charge, I wanted to share some art installations that blur the line with infrastructure. 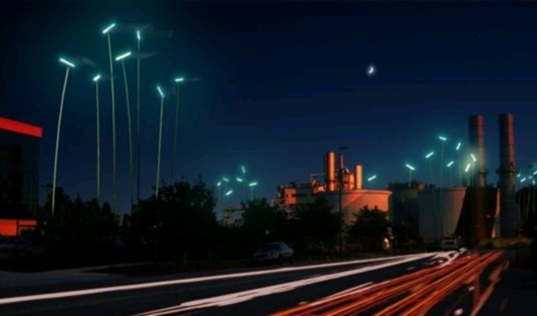 While I’ve already covered Infrastructural Art, it’s worth looking into how renewable energy manifests itself in art or as art, especially since most of the examples found are public art pieces. [Note I got a pending post about solar farms that covers the more creative end of industrial design that will have additional examples that just might transcend into being sculpture]. There are several emerging genres of renewable energy art, that range from the photovoltaics or wind turbines powering sculptural lights versus the shape of the energy generating surfaces as sculpture, to using the PV cells or wind turbines for purely decorative effects, last but not least, is representative art depicting various renewable technologies. I don’t consider all the small wind turbines sprouting like weeds in many cities to be art, just kinetic street decorations. At the other end of the art/decoration continuum are Theo Jensen’s Strandbeests and Calder’s mobiles which are certainly art – but since they don’t generate energy beyond their own motion, they will also not be included in this post either. 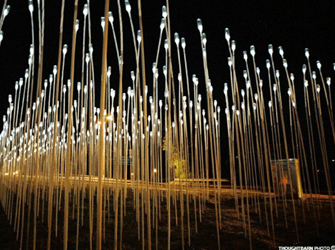 CO2LED was a temporary installation made by Jack Sanders, Robert Gay, and Butch Anthony in Rosslyn, Virginia in 2007. Gorbet Design’s ‘Solar Collector’ (2008) installation at the Waterloo Regional Operations Centre in Cambridge, Canada is interactive and folks can program patterns [though it’s currently undergoing ‘maintenance’] via the website. 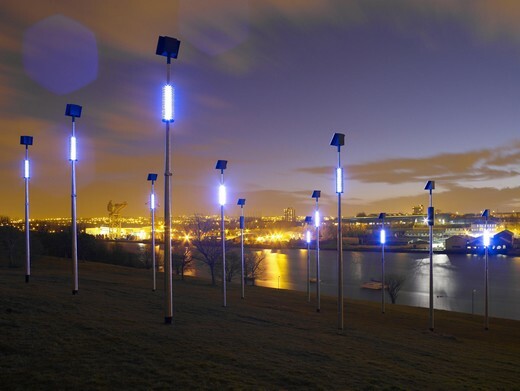 ‘Stuifmeel Ideeen’, aka ‘Pollinating Ideas’ in Amsterdam East, captures the kinetic energy of park users with a baton mechanism that then powers the lights (helped by pv panels). PowerPlant in Pasadena, CA (2006) by UeBERSEE seems to be powered by piezoelectrics capturing the 78′ tall pole’s swaying in the wind. Near Munich in 2009, there was a collaboration between Siemens, and artist Michael Pendry [check out the installation sequence!] to illuminate the blades of a 30m diameter wind turbine. Back in January, I fell into being part of the programming committee for the Sustainability Film Series that is being hosted by the University of Minnesota and The Film Society. The films that my students in LA 1001 are making will be featured on May 12th! 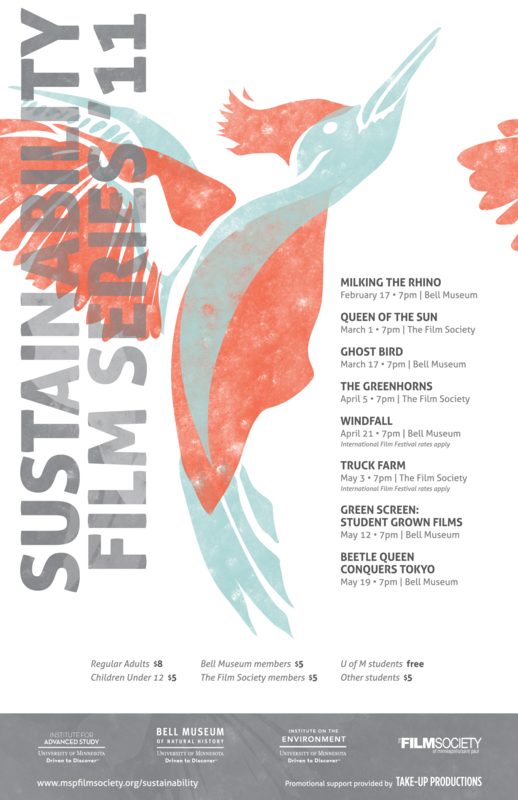 *Sustainability Film Series 2011* is an innovative and exciting collaborative series of films and panel discussions designed to generate awareness, conversation and debate around current issues in sustainability. The Series features local premieres of visionary documentary films that explore sustainability, followed by panels of vibrant and informative discussions comprised of leading academics, community leaders, and proactive citizens who present and exchange ideas and views on current and local trends in sustainability. *Sustainability Film Series 2011* is a collaborative, multi-venue project that represents a partnership between *The Film Society of Minneapolis-Saint Paul* , the *Bell Museum* , the *Institute on the Environment (IonE)* , with support from the *Institute for Advanced Study (IAS)* and *Take-Up Productions* . Look for [the poster] around town and on campus.